This thing is awesome. Granted it's very new so I haven't had much of a chance to make sure it doesn't break; but so far, I'm pretty impressed. 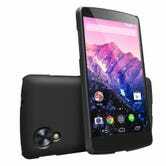 My first impression of it is that it is a perfect Christmas gift for anyone who owns a Nexus 7, 4, or 5. 1. 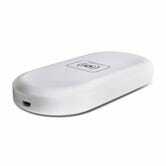 Prior to this, I had a usb backup battery that I used since I travel quite frequently. I really liked the convenience of not worrying about finding a seat in the terminal next to a jack or about needing 5 min to pack everything up before going and grabbing a snack from the food court. With this, I'll be able to stand up, grab both my phone and this, dump them in my pocket and go. No more messing with cords. 2. 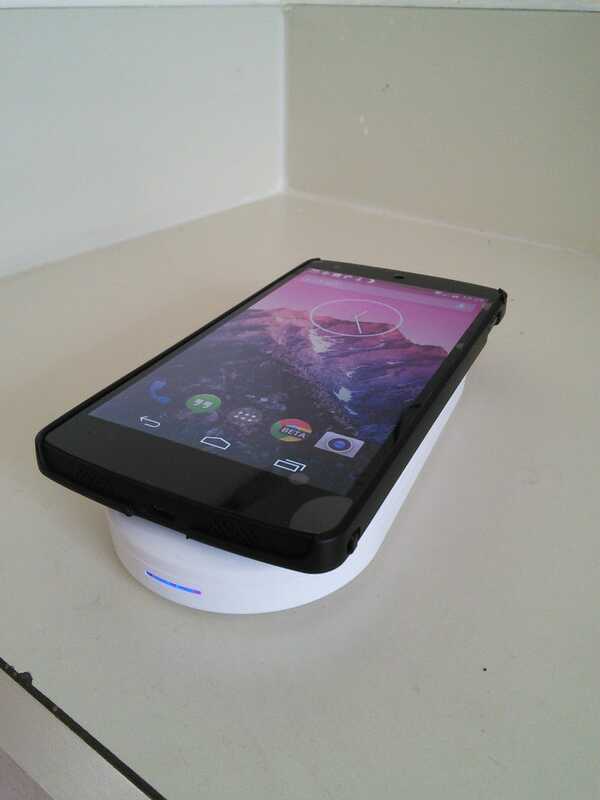 When at home, it works as a simple Qi charging station. You don't need to press the little button to turn it on when it is plugged in. Just plop it and go. 3. When at lunch with someone, it is not uncommon for us to put our phones on the table. This makes it possible for you to charge yours without looking like a complete dufus with a usb corded backup battery. The battery looks just like another goofy phone in the stack. 4. No proprietary plug needed to charge it. Micro USB all the way. My old Anker backup battery had a proprietary power plug. Besides my laptop, it's the last thing I use regularly without a micro USB plug. 5. No dumb beeps and whistles, as far as I've seen. Some Qi charging pads received negative reviews due to it beeping loudly when a phone was charging, charged, lost connection, gained connection again. This is pretty simple. There's a blue battery indicator and subtle green light when it is charging. 6. It fits in my pocket easily. 7. Cheap. Qi chargers have finally come down to reasonable levels. $50 is too much to spend on something that is basically a set of coils. $40 gets you the coils and the battery. I also found these guys, which I like as well. 8. Qi charging works though my thin Rinke case, which I also recommend. I think I just scared myself about how excited I am about the possibilities with this bad boy. Why am I glowing about this? Embarrassing.